Will you act, write, read? Will you code, build, lead? Choose your own adventure this summer at PSU! Come join Penn State Lehigh Valley Summer Camps and explore multiple opportunities to foster your creative expression and critical thinking. Half day of camp (AM or PM session) = $175. Full day of camp (AM and PM session) = $300. Authors and Artists – Follow in the footsteps of your favorite writers and illustrators in this fun camp that develops both literacy and creativity in young learners. Lego® Simple Machines – When you turn on the water or pedal your bike, you’re harnessing the power of simple machines. Explore the world of gears, wheels, levers, and pulleys through the magic of Lego®. Drama Dabblers – All the world’s a stage... so join the show! Learn to create and act-out various scenes and characters in this summer theater camp. Splash Lab at the Swim-In Zone – Join our friends at Swim-in Zone for lessons in water safety, water confidence, and swimming in a friendly atmosphere where learning is fun! Data Detectives – Numbers have a lot to teach us about how our world works. Be a Data Detective and uncover the mysteries of math as we collect, record, and describe the data of our daily lives..
Cracking the Code – Design the games you want to play. Learn how to write the code that runs your favorite programs by creating your own interactive stories and games. Roller Coaster Creation – Use everyday materials to build a model roller coaster that YOU design! A fun, hands-on camp that promotes problem-solving and creativity. Exploring Art in 3-D – Bring your imagination to life with three-dimensional artwork of your very own. Sculpt your masterpieces in paper, clay, plaster, and more in this hands-on camp. Lego® EV3 Mindstorms® Robotics – Change your world with Lego® robotics. Design, build, and program your very own Lego® robot, then test it out with challenge activities like capture the flag and robot soccer. Lego® Mindstorms® Advanced Robotics – Open your mind to opportunities in engineering with advanced robotics. 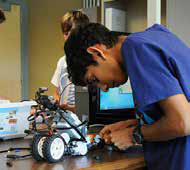 Build the future in our Engineering Lab with minds-on learning and hands-on Mindstorms® activities. CSI Lehigh Valley: DNA Evidence – A crime has been committed, and you are on the1 scene. Gather DNA samples, use scientific techniques, and analyze the evidence to bring the perpetrator to justice! High School Writing Workshop – Do you enjoy creating fictional worlds full of characters who defy the odds? Are you a steward of living history and document current events in moving articles concerning the human condition? No matter what your writing passion, come share your craft with other writers in this week-long writing workshop. July 16 – 20 9 a.m. – 3 p.m. This program will engage students in a week-long design challenge using Computer Aided Design (TinkerCAD) software, 3-Dprinting, and Lego® EV3 Robotics. Taught by PSULV faculty, Makerbotics is a practical introduction to all major aspects of robotic design and implementation. 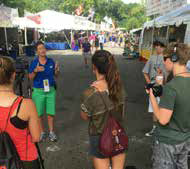 August 6 – 10 11 a.m. – 5 p.m.
Go behind the scenes at Musikfest, one of the largest music festivals in the nation, in this hands-on Video Production and Digital Marketing camp. This exciting camp provides an all-access pass to Musikfest, as well as hands-on training in Penn State Lehigh Valley's state-of-the-art television studios. Students will also learn from ArtsQuest Staff what it takes to market one of the largest music festivals in the nation. A two-week residential summer camp for rising high school juniors and seniors that encourages and inspires the next generation of entrepreneurs. Participants will learn key strategies for starting a business or business concept, and how to develop an entrepreneurial edge. Instructors include Penn State professors, Perkiomen School teachers, successful business leaders, and Penn State alumni. Designed to build confidence and skills in preparation for a student's entrepreneurial journey, the experience includes field trips to local businesses, hands-on problem-solving activities, featured speakers, and culminates with a "Shark-Tank" style challenge competition. Programming takes place at Penn State Lehigh Valley with additional programming and residency at the Perkiomen School. Their 165-acre campus includes dormitories and an Innovation Center exposing campers to the latest technology including 3-D virtual reality, additive manufacturing, computer design and rapid prototyping. Note: Programs may be canceled if minimum enrollment is not met.